When President Obama was hailed as ushering in a “post-racial” America, the phrase was often said derisively by those who wished to bury our country’s race mistakes of the past. That would include immigration exclusion laws, but the main debt was slavery. It was the only way some people could deal with a person of color elected president of the United States. This week, some are still making us pay the price for an Obama presidency. Post-racial? Donald Trump is undoing everything associated with Obama, taking it upon himself to make America pre-racial again. As America’s demographics become increasingly diverse, with racial minorities becoming the majority, Trump is doing his best to restore much of pre-1965 America. 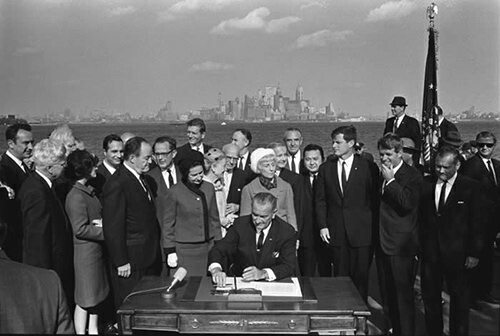 This is America not just before civil rights, but before the massive immigration overhaul that ended restrictive quotas and led to a growing Asian America. That’s all anathema to Trump, who has cast his political fate on white identity politics and appeasing the white minority with whom he identifies and defines as his base. Shall we review the recent past? When the KKK, neo-Nazis, and white supremacists marched without hoods in Charlottesville and Donald Trump couldn’t unequivocally denounce them without a teleprompter, that was the first sign. Then Trump pardoned Sheriff Joe Arpaio, convicted for racially profiling Latinos in Arizona. But the coup de grace was this week’s killing of DACA, the Obama era’s Deferred Action for Childhood Arrivals program that spared innocent children for the actions of their undocumented parents. He means the rule of law. Or make that the rule of Trump laws. He likes his pardon of Arpaio better than Obama’s executive action for the Dreamers. But it makes for some unbalanced scales of justice. One Joe Arpaio is heavy enough to fling 800,000 Dreamers’ lives up in the air. It was enough to make President Obama issue his most forceful statement to date during the Trump administration. And what about those core values? If you believe in the great ideas of diversity and compassion that have created this land of opportunity we call America, then saving DACA is a no brainer. Not only do we not punish children for the actions of their parents, but when we put them through a detailed process like DACA that vets them and forces them to put their trust in government, we don’t renege on the deal. It is both cruel and immoral suddenly to tell them the rules have changed–that bighearted America is no longer so bighearted. This is exactly the crossroads where we find ourselves in Trump’s America. Thousands protested around the country in reaction to the DACA announcement. But there was also a new chill among those who now see a clock ticking attached to their deportation. I know a young DACA recipient–an Asian American of Filipino descent–who just began her first year of college on a full-ride scholarship. When I first met her, she was so proud to speak out and had no fear about declaring publicly her status as an undocumented but thoroughly vetted Dreamer. When I texted her Tuesday, she was more guarded. Already in California, where the largest number (200,000+) of the 800,000 DACA recipients live, work, and go to school, Janet Napolitano, University of California president, has expressed the school’s continued financial, legal, and moral support for Dreamers. But she too was ready to lean on Congress. 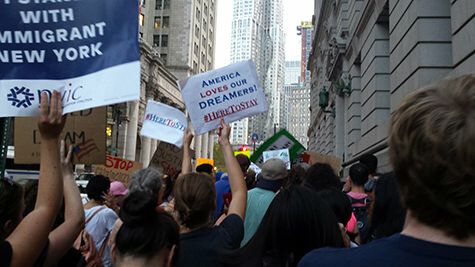 “I call upon the U.S. Congress to immediately pass bipartisan legislation that would provide a permanent solution for these young people–one that charts a secure pathway toward citizenship and allows these Dreamers to continue to live, work, and serve the only country most of them know as home,” Napolitano said. Everyone mentions Congress because Trump did, having put DACA in swaddling clothes on the steps of Capitol Hill. But Trump’s six month window to save it may be unrealistic given that Congress has yet to pass a significant piece of legislation this year. Is there hope for the Hope Act? Who knows what a legislative solution will look like once politicos start stuffing the sausage. Sen. Mazie Hirono doesn’t think so. Maybe the most encouraging sign is that a number of Democratic states’ attorneys general were all set to file a lawsuit to protect DACA, to counter the 10 Republican attorneys general who started the threat on DACA to begin with. You’ll recall the reason why Trump had to act on Sept. 5 was due to the threat of Texas attorney general Ken Paxton and nine others to add DACA to a suit that ended DAPA, the program for undocumented parents. Trump could have made the Justice Department defend it. But instead, he decided to use the DACA recipients as leverage to get Congress to bend to his will. On Tuesday, the Washington State Attorney General Robert Ferguson, who is 4-4 in legal suits against the Trump administration, most notably the Trump anti-Muslim travel ban, hinted at litigation to stop Trump’s ending of DACA. “We think the president’s action is not lawful,” Ferguson said on CNN, noting that legal action could involve violations of the equal protection clause, due process, and the administration procedures act. In the meantime, think of all the make-work and anxiety Trump has created in September, with a legislative calendar that includes the budget, tax reform, and Harvey relief. If he really “loved” the Dreamers, as he has often declared openly since February, if he truly valued their presence and the billions of dollars they’re worth to the U.S. economy (Moody’s chief economist Mark Zandi put the impact of the loss of DACA on GDP at $105 billion), then Trump simply should have fought to keep the program alive. That would have been the brave and moral thing to do as our country’s leader. Trump could have ordered his favorite cabinet member, U.S. Attorney General Jeff Sessions, to defend DACA in court against the Republican AGs for the good of the country, unity, and our adherence to American values. But Trump’s core values are all about himself, and the ratings of his flagging presidency. Trump had to kill DACA off. Trump’s rabid base, the once white majority dwindling to minority status, needs to be constantly reassured he’s got their back. In Trump’s pre-racial America, they’re the only minority that counts, to the exclusion of others.